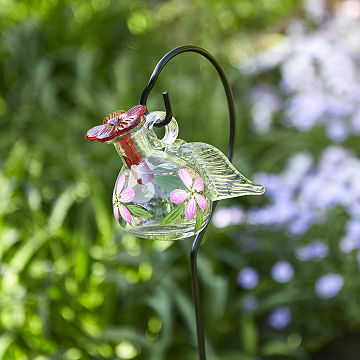 Handmade in Mexico, this sweet feeder attracts a garden favorite: the hummingbird. Fairy gardens are home to delicate plants, sweet decor, and, of course, breathtaking creatures. Artist Alfredo Garcia-Lucio's beautiful hand-blown feeder is designed to attract a buzzy favorite: the hummingbird. Its red opening signals the presence of rich sugar water inside, so the wee friends flock to it. Meanwhile, the recycled glass wings and hand-painted flowers add a touch of whimsy, just for you. A lovely gift for those who enjoy keeping watch on their garden as spring unfolds, or for anyone who still hopes to catch a glimpse of a passing pixie. Handmade by artisans in Mexico.